How does Ysolda do it? She designs and knits beautifully, she’s so darn cute and she takes fantastic photos of herself. I fail at all of those! OK, I can knit well, enough, but still managed to mess up simple yarn-overs…. I realized I needed a winter hat. I wanted one that could really keep me warm. I have made felted bucket hats and like those, but I needed a “play-in-the-snow” hat. The only hat I made was a ribbed hat that was quite stretched out and really didn’t keep my ears warm. 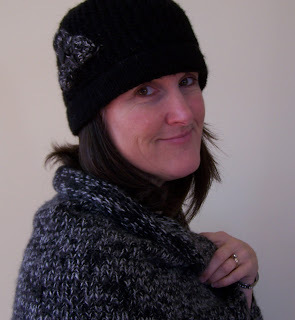 My Ravelry search lead me to the Conway Cloche by Gudrun Johnston of the Shetland Trader. 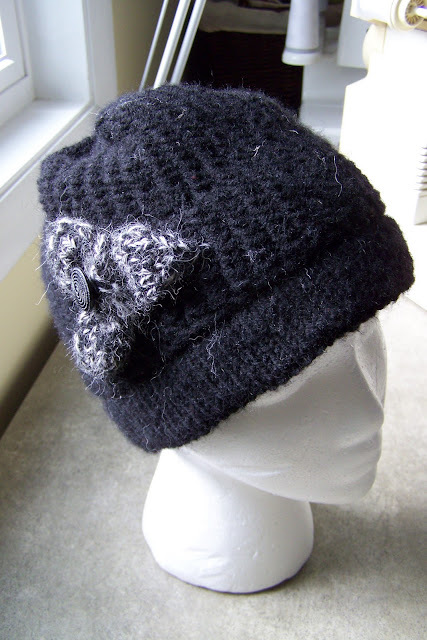 I like the cloche style and the dense and stretch fabric created by the stitch pattern really accomplishes the job. The pattern is straightforward, although I still managed to make a mistake. I’m sure it happened with my yarn-overs. Why does something so simple plague me? I put the mistake to the back and deemed it not noticeable in this yarn that my daughter bought me in Estonia. Knitters are notorious for never having matching hats, scarves, and gloves. 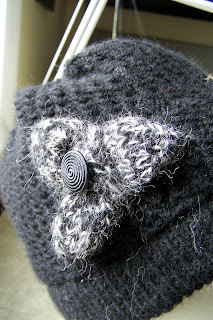 Since I know I’ll be wearing my November Ruffle Wrap as a scarf all winter long (it’s so warm and cushy!) I thought it would be fun to knit the flower to match! Annie loves the flower so much that she asked me to make her one. I immediately cast on and am progressing nicely. I’m sure I won’t make mistakes this time around. Your cloche looks great and that’s nice to have knit it with special yarn from your daughter. The flower is a nice touch. I like Ysolda’s patterns, too. I started one of her shawls but ended up frogging it for some reason. At some point I’ll have to revisit that pattern. Love the picture of you modeling your hat! i think it looks beautiful ! I am so envious of people who can knit!! I just can’t get it right… no matter how much a i try my silly scarves get wider and wider as I go on… and then all of a sudden they get skinny again. I love that baby sweater you knit a little while back, that is something that will be treasured! You could have fooled me with your mistake. The hat looks adorable and suits you so well. Love that yarn.